The butterfly bush, true to its name, is a favorite of butterflies as well as bees and other pollinators. Butterfly bushes are a favorite among many gardeners. The showy, fragrant blooms attract all sorts of beneficial insects to your garden. You may even find a hummingbird or two stopping by to enjoy the nectar inside the tiny flowers. When and how to prune a butterfly bush is a topic that comes up quite a bit with our readers. Butterfly bushes are crazy fast growers. They can easily grow up to 12 feet in only one or two growing seasons. Cutting them back is perfectly safe and something we do routinely. When should I prune my butterfly bush? If you’re a seasoned follower of this blog, you’ll already know what I’m about to say. The answer is…..ANYTIME! You should prune your butterfly bush when it needs to be pruned. Don’t let the calendar dictate when you need to prune. If your butterfly bush is getting scraggly or out of control, prune it- no matter what time of year it is. A young, scrawny butterfly bush. The butterfly bush pictured above is one year old. Its a bit on the scraggly side. Cutting it back about halfway will do wonders to help it branch out. A little pruning will help encourage fuller and more dense growth. I would also recommend moving this bush to a different location. Butterfly bushes are fast growers, and the small area next to the sidewalk is not enough space to contain it. It will need constant pruning to keep it from growing over the walkway. What about big butterfly bushes? The butterfly bush grew a bit out of control. This butterfly bush (above) is only about 2 years old. It has grown beautifully, but now that summer is coming to an end, its starting to outgrow its space. These plants are tough as nails. It won’t hurt it one bit to be trimmed down low. Butterfly bushes die back each winter. When spring comes they begin to grow back and bloom on new wood. You don’t have to prune your butterfly bushes every year, but its common practice to cut butterfly bushes very low each winter to encourage lots of new flowers next spring on the new growth. Although winter is still a few months away, we were ready to cut this bush back. So we did. Butterfly bushes are forgiving plants. They will come back and look like a million bucks next spring. How low can I prune my butterfly bush? This butterfly bush has been trimmed to under 12 inches. This is that same butterfly bush. We trimmed to under 12 inches. Top view of a heavily pruned butterfly bush. Should I deadhead my butterfly bush? Butterfly bushes require very little maintenance. Clipping off spent blooms will help encourage new blossoms. Its not a necessity, but it helps your plant look nicer. Its best not to let the plant go to seed. Because butterfly bushes are hybrids, you’ll often find that the seedlings look weedy. You can avoid those weedy spreaders, by deadheading your spent blooms. Spent blooms should be deadheaded. Check out our directory of free articles to find more helpful gardening advice! something I can feed it, to bring the blooms back? You could try a high phosporous fertilizer, but I really don’t like to monkey with plants. They know what to do and usually do best when we leave them alone other than some pruning. Eastern Shore, Md. I leave all mine go to seed for the little birds in the winter. They work the bushes for the seeds. What may I ask can one do to get the butterfly bush to overwinter? I live in WI on that little thumb that sticks out of the east side of the state. I have tried and tried to get a butterfly bush to overwinter and every year it dies. It looks like it is starting to bud out, and then we get as frost and that takes care of the plant. Any suggestions? You might try protecting it in spring but they can be touchy. I live in Western Massachusetts, and it appears as though the butterfly bush is not as strong or hardy in our neck of the woods. I had a Yellow bush it was gorgeous and attracted lots of butterflies. I had it almost 3 years, I would cut it back and cover it with mulch for the winter as I was told to do because we get lots of snow and its very cold. But two years ago it just never came up. And the same thing happened to my friend with her purple bush, I spoke to 3 garden stores and was told by all 3 that for some reason a lot of people have come in to replace their bushes too. Is there a disease we need to know about or maybe its just to cold here ? Its kind of comforting to know that I am not the only one that lost their butterfly bush in the last couple years, as sad as it is. I have looked every where for the yellow and cant seem to find it around here only the purple. We have given in and replaced the yellow with a purple bush in a different spot this summer 2018 and we are hoping for the best. One comment mentioned pruning back a butterfly bush “under the roots”. What is the best was to do that? I dug up my butterfly bush after only 2 years and I couldn’t believe the size of those roots. I would like to try planting another BB in another area where I wouldn’t have to worry about the invasive roots. Root pruning is done after Thanksgiving by simply pushing a spade into the ground approximately 18″ from the base of the tree all the way around. Going in at an angle to cut roots under the root ball is best. But this really only needs to be done on plants that are growing to be transplanted later and even then rarely done in an nursery. I had a hard time with my butterfly bushes here on the hot dry westside of Kauai. Aphids attacked all the yellows and oranges, the pink just never made it. I still have one lavender bush that bloomed beautifully but now seems to want to climb out of the ground! I have to mound dirt around it to keep the roots covered. Is that normal? Not normal, for some reason your plants are not rooting into the soil. Yes I bought on-line ONCE. It was supposed to be a red maple. It’s trunk is now at least 2″ in diameter and it is still green. Along the way, I added some iron to the soil around it as I live in S Idaho where the soil is pH 7.5 to 7.8 and it did nothing to turn it red. That is my experience with purchasing on-line.I lived in a house about a mile away from where I live now and it had a beautiful red maple so I know they can grow here. Sorry it’s a downer story. Red maple trees do have green leaves. They are called red maples because the leaves turn brilliant red in the fall. Maples with summer deep reddish purple color are Crimson King Maple, or Ruby Red maple. And of course Japanese maples, many have red leaves, some have green or orange leaves. I live in Northwest Florida and have bought several different red maple trees in the past. None of their leaves have turn red in the fall yet. I purchased an October Glory a few months ago as I was told that its leaves will turn red in this part of Florida. We will see. Fall is almost here. Mike I have 2 fig trees that have over the years became bushes and produce no fruit. My husband never covers them in the winter in NY. Should I up root them and replace with new ones? If they are not fruiting no reason to keep them. Not sure, but if they were grafted, maybe the grafted part died back. Sorry Mike but this tree is green ALL season & into the fall. Suspect they sent me the wrong plant. BTW, the trunk is now going on 4 inches in diameter. Enjoy everything about your website. I moved a black knight butterfly bush, probably later than I should have but it didn’t show much new growth, but now it looks like it’s dying. Is there anything I can do to bring it back? Question; Can you root Bougainvillea cuttings in sand under intermittent mist, and what is the best time of the year to do so. I have see some butterfly bushes trimmed up and shaped to a nice tree bush. How do I go about doing this and is it recommended? I have had great success pruning my butterfly bushes back nearly to the ground every Spring. For nearly 10 years now they come back nice and full, grow to about 5-6′ and attract all kinds of butterflies and other pollinaters and, yes, even a few humming birds! Thank you , I will wait patiently for new growth. Mike, you say when you propagate plants through cuttings to make sure they are not patented varieties. How do I know if my butterfly bushes are patented or not? I have a “Dark Knight”, and “Black Knight” and “Burgundy”, says the nursery tags on the plants. Like Sharon mention, you can use the patent website, but it’s a real pain to use and it’s easy for it to not return information that is there. This is what I do. First check the tag. If a plant is patented it should say so right on the tag and usually says; “Propagation is Prohibited”. Second do a google search and look at wholesale nursery websites. The wholesale sites that do not sell to the public do a good job of displaying the PP number. If you see PP and a number by the name of the plant, it’s patented. I’m so glad I found this article about pruning a butterfly bush. I bought one this past year and loved it! However it became such a bee magnet that I was unable to weed out an undesirable and uninvited ground cover that grew beneath it. Since getting badly stung by something earlier this year I’m very timid to try to do so and will find a new spot for it. Still, I learned some great information from your article so thank you. Hi Mike, I have a Hardy Hibiscus, & wanted to know when is the best time to cut it back, as I’m trying to keep it in a nice tight ball on top!? Also, I always seem to cut back my Hyrdrangea’s at a Bad time, as it didn’t bloom at all this year! I think I’m cutting it back at the wrong time! Lastly, are you knowledgeable about Gopher’s Purge, & if so, do you have any, & seeds for sale!? Thanks Mike! Right now (September) hardy hibiscus are still blooming. Trim them when they are done flowering. Best to trim them between October and April. They bloom on current years growth so don’t prune during the growing season. Prune your hydrangeas right after they bloom. Many didn’t bloom this year because of the harsh winter. This is a great sight! I always get great help! Butterfly bushes are considered invasive weeds in parts of the country. They spread like wildfire. I convinced my neighbor to prune hers….below the roots! There are other choices out there to attract butterflies and hummingbirds. Yes, it is easy to grow. Yes, a beginner probably won’t kill it or mess it up pruning it. But that doesn’t make it a good choice UNLESS the gardener is dedicated to deadheading it before the flowers go to seed. Monrovia is rumored to have a sterile Butterfly Bush that won’t spread and become invasive. Shop carefully! I must have the sterile BB because mine do not make seedlings, and I wish they would. I love them. I think you have mistaken butterfly weed (orange flowers) for butterfly bush. The Second pic above is NOT a Butterfly Bush 🙂 Dunno what it is, but it definitely is not a BB. FWIW, far better to let a BB alone til late fall. Better yet, wait and cut to ground – 12 – 18 ” on April 15. The leaves DO nurture the plant til it dies back. If someone prunes a BB back as hard as indicated in the pic the plant will be set back. Obviously, any plant should be kept in bounds. But save the heavy pruning on them til late Winter. I pruned those butterfly bushes back that hard at the worst possible time of the year because they look terrible and were ruining the bed. Which is why they are coming out in Nov. Each August we have an event here at the nursery for all of our backyard growers and I wanted the place to look nice. But I’m sure those plants won’t be set back by much. They sure look a lot better than they did before I pruned them. But they are so vigorous, I’m giving them away. I planted my first 3 butterfly bushes two springs ago, one got huge, two got big but not as big as the one, Not knowing how to trim them back, I took a chance and cut them back to about 12″ like you did in this article. Two survived and did well this summer but the biggest one died. Of course last winter was extremely bitter cold, several shrubs died here. I’d just till the moss in and probably add some agricultural lime to the garden. Most soils become acid over time and moss grows on acid soils. Of course this is true in the north. In southern states soils are more alkeline. I live in Gold Country in No. CA and here we usually don’t prune until Spring but I have cut it back earlier with no problems. I was wondering about pruning Crepe Myrtles ? My elevation is about 2200′ Some snow but never lasts very long. We don’t have Crepe Myrtle here in Ohio but all that I see in the southern states they trim hard when they are dormant. I’m sure you can trim non dormant plants without a problem, but if you are going to do heavy pruning, doing so when dormant is better. I’m in north GA. Here, we prune crape myrtles in Jan-Feb.
Didn’t know deadheading would encourage new blooms, thanks for the advice! I got the funniest looking buddleia in the mail, (usually the supplier is great) I will be happy now to prune it right down for next year. Regarding the pictures of the two plants that were pruned to 12 inches, the first picture is a Butterfly Bush, but the second picture looks like a Hibiscus plant, and the canes are hollow like a hibiscus, so is it a hibiscus plant? Thanks. Nice call! Here’s the deal. I’m one person and I’m no longer the 25 year old energizer bunny that I once was. I can’t do it all and my assistant took these photos and created this article. But you are right and you are very observant. In that bed I trimmed both butterfly bush and a couple of Hibiscus and apparently she didn’t catch that. As much as I love to, I just can’t do it all and this time of year I prefer to be in the nursery working with the plants and other projects. I spend less time writing this time of year. I have some Privet plants, started from cuttings. They were transplanted into quart pots this spring. There are several that the leaves are turning brown and shriveling up and the plants are dying/dead. What can I do to save the rest of my plants and what is wrong to begin with? My guess is they dried out in those smaller pots. It happens easily. Either shift them to a larger pot or just plant them in a bed. It’s imperative, if you are going to grow butterfly bush at all, to dead head the flowers before they produce seed. It is an invasive plant that does nothing for the propagation of butterflies. Plant butterfly weed instead. Thanks for this blog, Mike. Am home with a virus and that bush is along side a very very overgrown forsythia. I plan to root the cuttings of that ….as soon as I work up enough energy to prune all of them. !! the butterfly bushes are gigantic..and I’ll give them a therapuetic prune too!! About a month ago I was able to save two nice big stumps from the trash man. Guess who has little white flowers on New shoots on those ugly old roots. I do! Can I make Simi hardwood cuttings in October? I wonder…. I’m going to wrap my big narly New friends in straw to help them make the winter…that’s for sure. The one clump is big as round as an outdoor trash can and half as tall with the roots. Do the flowers start white then turn purple or am I lucky enough to find a white flowering one…I wonder. Still very proud that 3 of my 5 Viburnum cuttings made it and are growing like weeds. I give all the credit to that Espoma starter fert with microriza… I’m very impressed. I planted little white gumpo azaleas for a lady and they boomed 3 times while tripling in size…very impressive if you ask me. Mike, you ever try that bag of fert on your stuff? Well, I have to get out there and check on my babies… LOL. 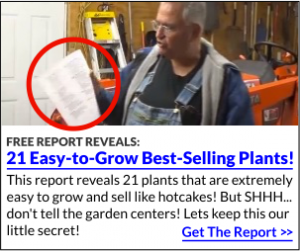 I’m looking for a pair of 4xlt bibs so I look just like you… You are my plant guru hero, please keep up the good work. After the accident I was pretty depressed…your videos opened a new door…and turned on a new light for me. I look foward to seeing your new stuff…give those donkeys a scratch on the head…they are just so cool! Big Dave in Pa.
Roger that, I will most certainly scratch the donkeys on the head for you. Right now I’m building them a new house that will be much warmer this winter. They’re going underground a bit! I’ll post pics when it’s done. thanks for the tips. I have a crazy wild rosebush I am hoping to root and replant in other parts of my gardens. I appreciate all your great advice and will get that root compound and start my cuttings. You go girl! Just keep making those baby plants. Mike, I’m in the doghouse. I have a retired AAAA type engineer hubby, and I recruited him to get started on making little plants this year. He went out before I had the screen house done, the mister system set up, and started making three ton boxes to hold sand-trust me you will get a hernia picking them p, then spent a whole weekend trying to get one stuck. (he got about 90 I think) I was pretty ill and couldn’t help and he overthought everything. My heath took a good turn, and I got out there today and calmly trimmed some things up, and spent the afternoon with my new corona pruners (thank you, they are GREAT to work with, my hubby had a fit about me getting those too) trimming up those prunings and made vatloads of little cuttings that are soaking in their rooting compound until tomorrow morning; then I’ll stick them. He’s mad at me because I made it look so easy. And I got so much done. I TOLD him to watch your videos first… just thought I’d let you know I’m actually rather happy despite his offering my new roomie is the lawnmower because I’ll have to sleep in the shed. Thanks Mike, this is one I’d rather be in trouble for… heh. Well . . . I guess I’m glad you’re happy. Lots of people over think much of this. If only people could spend a day with us. Everything we do happens quickly and it’s just fine. I’m glad he’s willing to help and eventually he’ll figure out where this is going and that it’s not a bad thing. I have an mature ornamental peach tree that has gone nuts!! Prune now? Also, is it possible to transplant? It is about 10′ tall. Thanks. You have been talking about pruning, I have a mature ornamental peach tree that has gone nuts!! It is also leaning-prune and/or transplant?? Your advice greatly appreciated. 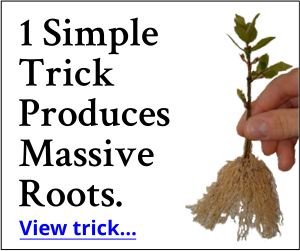 Prune it and stake it to get it growing straight. Pruning it will do it good and not harm it. I plant it in the ground if at all possible. Plants do best in the ground. If you can’t do that, then by all means get it into a bigger pot. And they are a great starter project for a beginning propagator. Soooo easy to grow from cuttings.